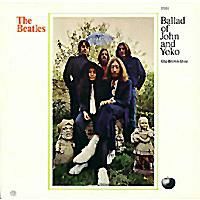 First released: May 30, 1969 (UK: Apple R5786), June 4, 1969 (US: Apple 2531); b-side "Old Brown Shoe"
"The Ballad of John and Yoko" is a unique song in Beatles history: completely autobiographical, dealing with events well known to even the most casual Beatles observers, and recorded in one day with only two Beatles playing as a full band. On March 14, 1969, John Lennon decided to marry girlfriend Yoko Ono, and as with many things in his life, set about doing it rather impulsively, with little planning. John's original plan, worked out while en route to Dorset to introduce Yoko to his Aunt Mimi, was to get married at sea. There were several legal problems with that idea, however, so the couple headed to Southampton, England, in order to take a ship to Paris and wed there. John was turned back immediately, not being a French citizen, and personal assistant Peter Brown was dispatched to find an alternate location. Gibraltar, being a British protectorate, fit the bill. After the wedding, the newlyweds flew to Amsterdam, where they had reserved the Presidential Suite, and invited the press to join them in their room. Since the duo had already shocked the world by appearing full-frontal naked on their Two Virgins album (1968), reporters assumed they were being called in to witness the consummation, as well. What they got instead was a week-long press conference where John and Yoko stayed in their marriage bed, fully clothed, and protested the war in Vietnam. What the duo saw as good advertising for the anti-war movement, the press saw as shameless showmanship. At the end of the week the two flew to Vienna and stayed overnight where they introduced the "Bagism" performance art piece, which consisted of the duo holding a press conference from inside a bag. (The idea being that the bag conferred anonymity.) The newlyweds then headed home to London, where the local press was, surprisingly, quite cordial and even enthusiastic to see their native son return. Most of the lyrics are self-explanatory for those who followed the events in question, but two phrases bear out further explanation: "eating chocolate cake in a bag" refers to the dessert John and Yoko had during the Bagism event, the Sacher Hotel's famous Sachertorte, while "fifty acorns tied in a sack" refers to the couple's practice of giving acorns to world leaders in hopes that they would plant them as a symbol of peace. John's use of Christ imagery offended many listeners, since he likened himself to Jesus with the hook "They're gonna crucify me." This may or may not have been a direct reference to his infamous 1966 remark that the Beatles were "bigger than Jesus." In any event, several US stations banned the song, leading it to stall out at Number Eight on the Billboard charts. In England, however, it shot straight to Number One (their last in the UK). The Spanish guitar hook at the end of the song is a direct quote from "Lonesome Tears in My Eyes," a 1956 cut from Johnny Burnette and the Rock N' Roll Trio that the Beatles played often on stage in their early days. A Beatles version of the song can be found on Live At The BBC. The government of Spain, headed then by dictator Francisco Franco, was also angered by John's location of "Gibraltar, near Spain." Clearly Lennon added this to the line to make it rhyme, but the country was then embroiled in a dispute between Spain and UK over its ownership. Franco subsequently ordered this song removed from all Spanish Beatles albums. This was, amazingly, the first Beatles single not to be issued in the old mono format, but stereo only. It was also the last Beatles song specifically recorded for release as a single. John appreciated Paul's help on this song so much that he later gave co-authorship credit to him on his solo song "Give Peace a Chance," recorded at yet another "Bed-In" two months later in Montreal. It's long been rumored (but never confirmed) that Peter Brown himself enters the studio at 2:50 during the original recording, causing a somewhat audible "Hey, Peter!" from John. It is true that the early, unused take four of the rhythm track features John shouting "Hey, go a bit faster, Ringo!" To which Paul, on the drums, replies, "Okay, George!"